I had the honor of being with Fr. Cortina several times, in Guarjila, El Salvador (1999 and 2001) and here on Creighton’s campus when we gave him an honorary doctorate. Fr. Cortina offers us all a rare model of a bridge-builder (literally, as a civil engineer!) who was able to link rigorous academic studies and research, pastoral ministry with the campesinos of Guarjila, and “speaking truth to power” with his Pro Busqueda fight for justice for children stolen by the military during the war. And he humbly bridged these worlds knowing that he was the one learning and receiving from the people with whom he worked. (I recall a touching moment on Fr. Doll’s Jesuit Journeys video when Fr. Cortina is translating for a woman who had her children stolen yet forgave the people who committed this crime; Fr. Cortina admits on the spot that he would likely not be able to forgive this deed and that the woman has taught him what it means to forgive.) 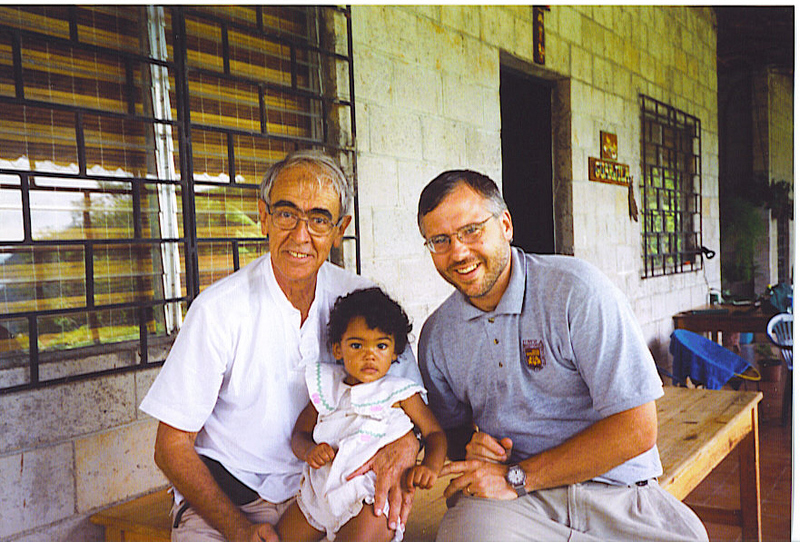 I include in this brief reflection one of my all-time favorite pictures: it is of me and my youngest daughter, Rosa, in 2001 with Fr. Cortina in front of his home (now a museum); the cross on the wall behind us was brought back to the Cortina Community a few years later by Kelly Orbik (as a gift from Fr. Cortina for the new Cortina Community) and now hangs in the Cortina Community, McGloin 5th floor. His spirit lives on.